Council President Darrell Clarke is a guy who brags about driving to the corner store, so it's no surprise that his vision for the 5th Council District looks a lot more like the suburban sprawl of Phoenix or Atlanta than the rowhouse neighborhoods of Philadelphia. That would be the predictable result from his new bill doubling minimum parking requirements for new multifamily housing. 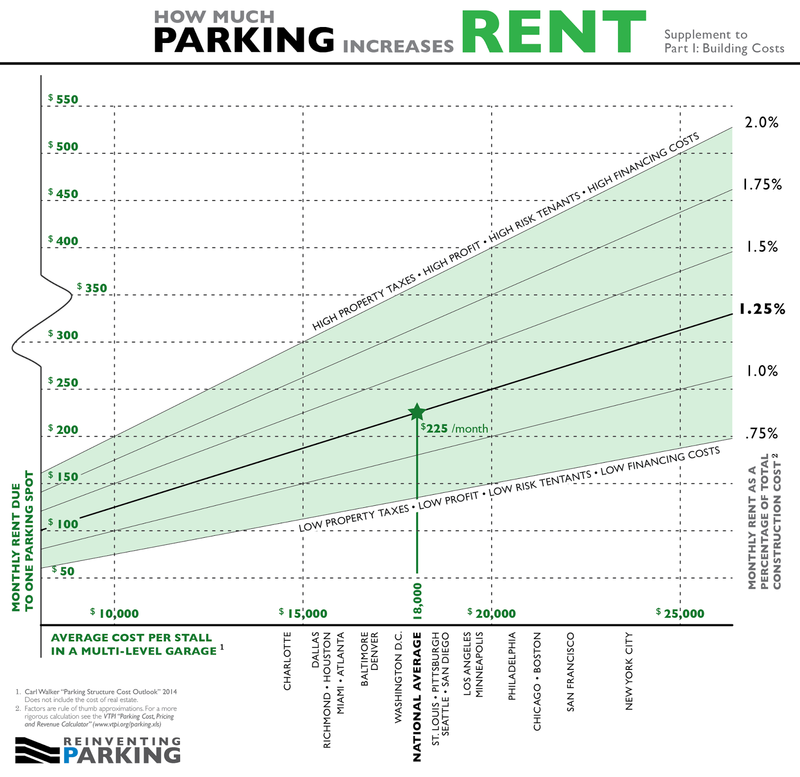 Minimum parking requirements are like a fertility drug for car-dependence. There are a lot of different reasons why this is the case, covered extensively in this classic paper by Donald Shoup of ULCA, but the gist is that they force neighborhoods and commercial districts to grow in a much more sprawling and less walkable way, in order to shoehorn a bunch of extra cars in. Buildings have to be shorter and spaced further apart, making it harder to walk to destinations, and making transit less useful. The result is neighborhoods where everybody has to drive to the corner store. That may work for Darrell Clarke, who makes about $163,000 a year and has extra money to burn, but it doesn't work for the many 5th District residents who save money by walking or riding transit, and who would lose out under Clarke's "Drive to the Corner Store" agenda. It should also go without saying that this is exactly the opposite of what a city that's supposedly committed to "doubling down" on the Paris Accords climate deal would do. Another important way this bill would harm the interests of 5th District residents is that it would force people who don't want or need parking to pay extra rent to subsidize their neighbors' parking. Parking minimums force home builders to include an arbitrary minimum amount of parking in their buildings. Several studies have found that cities typically set the minimum way too high, saddling buildings with more spaces than residents want. That excess parking appears to be free (which explains the political appeal of parking minimums) but there's no such thing as free parking. In realty, it just gets bundled into the cost of housing and services, and it's way more expensive than many people realize. Back that out into a monthly cost, and we're talking about adding $150-400 per month to rents for people who may not want or need parking. On the same day that Clarke co-sponsored a bill promoting inclusionary zoning, he also moved to strengthen one of the most powerful tools of exclusionary zoning. The Philadelphia Association of Community Development Corporations panned a prior version of this bill, saying it would increase the cost of developing affordable housing. It's time for Council to wake up to the fact that there's just no option to build our way out of our tight curb parking challenges, and it's too expensive to try. The real solution--for residents' household budgets, for affordable mobility, and for the planet--is to manage oversubscribed curb parking with pricing and residential permits, and put the money toward improving walkability and transit service. Rather than trying to shoehorn more cars into congested neighborhoods, Clarke should be zoning for more transit-accessible housing and jobs, and improving transit service for 5th District residents using his powers over streets and land use.